"Dreams feel real while we're in them. It's only when we wake up that we realize something was actually strange." Before Christopher Nolan invaded our dreams with the endingly mind bending Inception, the late, great Satoshi Kon did it first with a film about dreams that is equally as mind bending titled, Paprika. Even though this is a review of Paprika, I will be making a few comparisons between it and Inception, since Inception is one of my favorite movies as well. Based on the novel of the same name, Paprika is set in the near future where a new dream therapy device named the "DC Mimi" is used to enter and record people's dreams. The film revolves around a woman named Paprika, who is a part of the dream world. However, something goes awry with the DC Mimi, thus driving the conflict of the story. Of course, the film is much more complex than that, but if I were to say anymore, that would be spoilers. 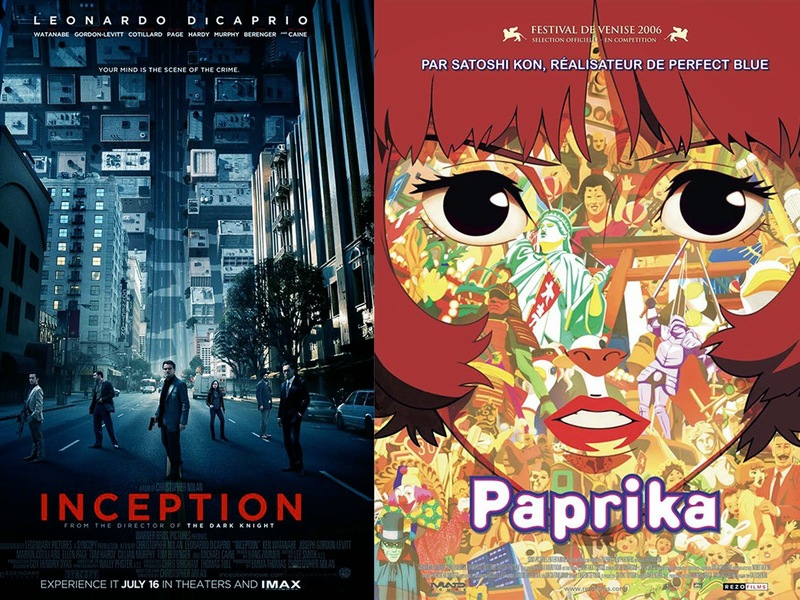 Below is a gif set comparing Inception to Paprika. Plot: 8.6/10- Paprika's plot is complex and filled with metaphors. From the name of the film's heroine, Paprika being the metaphorical spice, to the use of filmmaking to drive a certain character's arc forward, the film is rife with symbolism and metaphors without bogging down the plot or trying to be "too deep" for its own good. While a complex plot is good, the film can be a tad incomprehensible at times to the point where the audience is not entirely sure what is happening. At the same time, the incomprehensibleness of the film effectively produces the disorientating experience of a dream. In many ways, Paprika is like Inception on acid, by which I mean the film is all kinds of trippy at certain points with tons of colors everywhere and a lot of stuff happening on screen, which is both a positive and negative. The weakest aspect of the film is the motivations of the antagonists, and while they kind of make sense, it could have been handled better. Also, the mystery as to who the antagonist is more of an afterthought. Characterization: 8.7/10- Despite the short runtime, the characters are given effective backstories and reasons for being the way they are. One aspect of the film is likely to confuse viewers that is not explained until the 30 minute mark is the film is that *Possible Minor Spoiler* Doctor Atsuko Chiba turns into the alternate persona of Paprika in the dream world. *End Spoiler* As a character, Paprika is fun and energetic, and the film uses her character to explore some interesting concepts. Detective Toshimi Konakawa is the character in the story that goes through the best character arc, and some of the things used to explore his character were particularly interesting to me. In some ways, he is like Cobb from Inception as he battles his problems from within. Action/Suspense: 7.1/10- Paprika is not necessarily an action film, but there are some chase scenes through the dream world. Acting: 9.1/10- After briefly comparing the Japanese and English audio for the film, I opted for the Japanese because the English seemed particularly weak compared to most other modern dubs. Megumi Hayashibara gives the standout best performance as Paprika with her energetic and peppy voice. Art Style: 9.9/10- Wow! Paprika looks amazing! The film is eight years old, and it still looks better than most anything today. The colors are vibrant and stunning, and the animation is wonderfully fluid. Most of the character models, particularly the female ones, are well drawn and look like a blend between eastern stylization and realistic. However, there is one character model that is difficult to look at and that is Doctor Kōsaku Tokita. Even though he is a morbidly obese character, he is unrealistically huge, and his scenes take me out of the movie when he is on screen. Soundtrack: 8.3/10- Paprika's soundtrack is fittingly trippy for the dream setting. Humor: N/A- While mostly lacking in humor, there is one hilarious joke. Non-Otaku Appeal: If you know that the film is a trippy journey into the dream world, you should be able to enjoy it. Also know that the film is R rated for a reason, and that there is one particularly weird scene. Entertainment Value: 8.4/10- Despite the occasional weirdness and incomprehensibleness taking me out of the story for a brief time, the movie is an entertaining ride through a bright and colorful dream world. Overall: 9.2/10- Overall, Paprika is like an almost art house version of Inception with stunning visuals, intriguing metaphors, and an engaging story that is not to be missed. Closing comments: The way to describe Paprika is that it creates the experience of a lucid dream effectively, which is one the film's best aspects. For another opinion of the film, you can click here to read Ian's review from Banon's Roar.